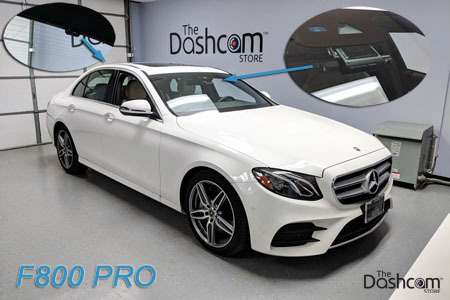 If you are looking for the best of the best parking mode dash cams, look no further than the F800 Pro. It is the latest and greatest from Thinkware and builds on the F800 platform. Available with an optional rear camera, the F800 Pro offers a fully featured and refined dash cam setup. The night time video quality is very impressive with the Sony STARVIS sensors (front + rear) and Ambarella A12 chipset, among the best of the 2 channel systems. The F800 Pro has the lowest energy consumption out of any Full HD + Full HD parking mode setup. The F800 Pro has parking mode priority in the partition settings which dedicates almost half the memory card for parking mode if necessary. And it has an incredibly discreet design so you can feel confident in leaving the F800 Pro in your vehicle overnight. With the Pro model there are some further refinements like the all black body, 128GB card support, and Thinkware's version of over-the-cloud: Thinkware Cloud. CMOS Image Sensors allow constant front and rear view Full 1080p HD resolution recording during both daytime and at night, along with a 140-degree wide angle lens view. This will minimize blind spots to assure recording of all events without fail. Please note: the F800 Pro’s Full HD rear camera is sold separately. Dash cam videos recorded in a low-light environment, such as dark alleys or parking lots, may not be clearly identifiable. Super Night Vision 2.0 in the F800 Pro uses Image Signal Processing (ISP) technology to record a clear, visible video in any situation- while driving or parked. Perfect image processing even in low-light environments. The Sony EXMOR R STARVIS Image Sensor applied to the F800 Pro provides rich colors and the optimal resolution. STARVIS technology improves EXMOR R's low light sensitivity by providing optimal image quality in visible ray and near-infrared range, allowing clear imaging in low light environments. ㆍParking recording mode can be activated upon installing the F800 Pro with the optional hardwiring cable. The Thinkware dash cam F800 Pro is equipped with the Lane Departure Warning System (LDWS), Front Collision Warning System (FCWS), Urban Front Collision Warning System(uFCWS) and Front Vehicle Departure Warning (FVDW) to ensure driver safety with a voice warning. The Dashcam Store™ is an official USA distributor of the Thinkware product line. Beware of unauthorized or grey-market third-party sellers! ** Optional accessory and installation required. Only one of Rear View Camera can be used at once. Thinkware F800 Dash Cam: Super Night Vision 2.0 Demonstrated.